It feels like we've exhaustively covered every single bit of marketing for The Dark Knight Rises, since we're as excited as anyone for the final Christopher Nolan-directed Batman movie, and every bit of marketing means we're a step closer to the release. But while we can post trailers and posters and stills online with no problem, there's one part of marketing that the studios can't give us, and we have to come across some other way: billboards. Sure, billboards might not be as high-profile or important as trailers or TV spots during the Super Bowl, but they can be just as creative, as evidenced by the new billboard for The Dark Knight Rises we just spotted online (via Keith Calder). What is there to say beyond a simple slow clap? That abstract Batman logo has been ever-present not just in the marketing for The Dark Knight Rises (like this teaser poster), but in the Batman character ever since the comics. The Batman logo on the chest is much subtler in the Nolan films, but it's clear he and the Warner Bros. team like the expressive simplicity of it-- and it's pretty powerful to see that silhouette appearing to smash through a billboard. Is it just me, or are we supposed to assume that Bane is the one who has smashed it through? 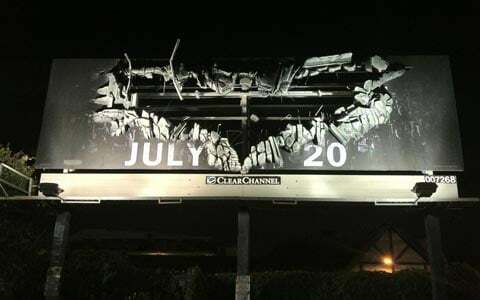 The Dark Knight Rises, as you of course know, doesn't come to theaters until July 20, but it's very clear that the countdown has already begun. Is there another thing left to come this summer that carries the same level of excitement? Are we all just going to go into a deep depression once this movie finally opens? We've got another few weeks left of anticipation before the AB-- After Batman-- period of our lives begins. Enjoy it.